the local choice. St. Johns Ore.
the local choice. St. Johns, Ore.
Honey the way it is meant to be, right from the bees. 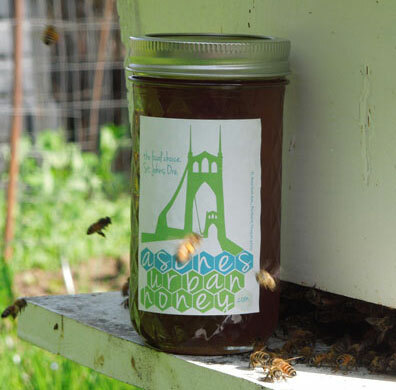 In North Portland, just a few blocks from the St. Johns’ town center, you will find Asches Urban Honey, a family business that specializes in sweet local honey from our own organically tended honey bees. Proprietors, John and Mary Ann Aschenbrenner, help ensure honey bee health by leaving plenty of hard-earned nectar on the hives after the late summer harvest. We allow our hives to re-queen naturally and occasionally capture swarms to replenish hives that perish. On this website you will find videos of swarms and the bee dance, recipes using honey as a sweetener or healing agent, information about apitherapy, also known as bee-venom therapy, and much more. Enjoy our website! Asches Urban Honey is bottled straight from the comb without filters, heating or pasteurization of any kind. Thank you to the volunteers who come out, braving angry bees, to help with the annual honey harvest. 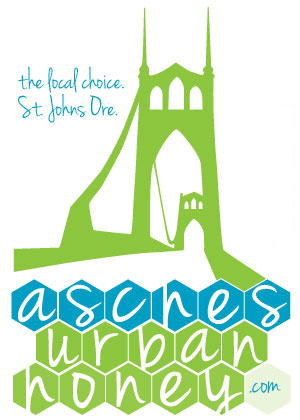 This year, 2015, Asches Urban Honey will be available on Saturdays beginning September 19th. This series of three swarm videos were captured on April 18, 2015. The first video is when the swarm is fully flying, the second when they are settling down and the third, recorded half an hour after the first, shows a bee dance. Feel free to enjoy these and share. Closed captioning is provided.